Imagine if King Lear had ended just after the great storm: on the heath, with a cold, bitter Lear sprawled in the muck, railing against mankind. Imagine if Romeo and Juliet had ended with the curse of Mercutio, as he is dragged offstage, dying, screaming, "A plague on both your houses!" Imagine if Iago had written a play. That's what you'll get from Robert Richmond's Timon of Athens, currently playing at the Folger Shakespeare Theater in Washington, D.C., a flinty, sleek production of one of Shakespeare's most rarely performed plays. If you see this Timon, it won't be hard to understand why the play doesn't often make it to the stage. It is a play of resentment and unrelenting, small-souled meanness. The play concerns the tribulations of Timon, a rich Athenian who spends his entire fortune bestowing favors upon his fawning friends. Timon may be played as a sincere benefactor in some productions, a generous and kind soul naïve to the wicked ways of the world, but Ian Merrill Peakes's Timon is a vain cultivator of hangers-on. He is a man who likes the power trip of buying someone’s flattery, but is also foolish enough to believe in his purchased praise. Washingtonians will easily recognize the type. When Timon suddenly finds himself destitute, his former flatterers abandon him. The shock of their betrayal drives Timon nearly mad—he leaves Athens, and goes to live in a cave, nearly-naked, eating roots, cursing the city that created him (and anyone who comes to comfort him), until he shrivels up and dies. In Timon, we watch a foolish man suffer and perish, learning nothing from his foolishness except bitterness and hate. There is no tragic catharsis, no release of emotion, no illumination or wisdom at the end, only a bright flash of light followed by oblivion. As I was leaving the theater, I thought that the only reason I would recommend seeing Timon was to someone who needed to check it off the list on your way to seeing all of Shakespeare’s works performed on stage. There were no obvious, annoying emendations (although there’s one scene that’s been altered to be a real gross-out). Peakes carried this difficult play on his brawny shoulders with force and an arresting quality that was intense and compelling. It’s hard to make a misanthrope charismatic, but he was very watchable. It was the first time I've ever left a Shakespeare production disappointed in the play rather than in the production. But, after thinking a bit more (and upon reading the last three scenes of the play, which I did not learn until later were cut from this version), I realized that, if this Timon had been set in the era for which it was intended—late classical Athens—I would have had a much better experience. Richmond's production takes place in the not-so-distant future, with mirrored surfaces and shiny fabrics. There is a kind of digital news ticker onstage at all times that scans and announces the name and profession of all of Timon's many visitors. It also tracks the transfers of Timon's wealth. Sometimes it livestreams his angry rants against the world. While this set-up seems to be trying to make some kind of statement about our status-obsessed, social-media intoxicated society, it obscures the philosophical core of the play. To understand this play, we need Timon of Athens, not Timon of the Starship Enterprise. While some of Shakespeare's plays can be set in any time or any place (up to a point), there are some, like Timon, that can only really be understood in the light of the place in which they are meant to be seen. Thus, while Robert Richmond’s Timon, is thoughtful and well-acted, it is another example of what happens when a director tries to make a production "current," and in doing so, wipes out what makes it eternal. "Timon" comes from the Greek word timé, meaning "honor." 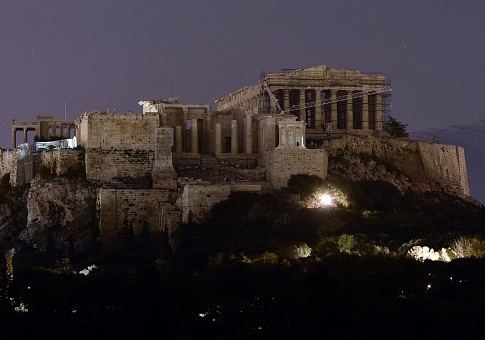 This is a play about the honor of Athens—the degraded, dying honor of a once-great city. That the sickness in Timon's soul is also the sickness of a city. Athens, once the paradigm of the free and democratic city, is rotting from within. Timon’s friends are all highly skilled: jewelers, poets, artists, mercenaries, dancers, and businessmen. As many others have pointed out, this is the only Shakespeare play in which the only female characters who speak are whores. Timon's dinner parties recall the inhabitants of the feverish city in Plato's Republic. There are no wives, no families, and no children in Timon, and Richmond edits out the one mention of a servant who wants to get married). Timon spends lavishly with no vision beyond his own immediate enjoyment. He imagines that his friends might bestow favors upon him at a future time, but that is as far as thoughts of the future go. He does not think of heirs, of his city, or of any institution that might last beyond his lifetime. It’s clear that Timon's companions, his fellow citizens, and even the Senators that represent him, are also too absorbed in their own particular self-interests to hold together as a community. A revolt against Athens erupts, and as the play ends it is on the verge of being conquered by a mercenary captain called Alcibiades (Maboud Ebrahimzadeh). This is not the famous Alcibiades of Pericles's Athens and Plato's dialogues, but he is a dull echo of him, just as the philosopher who torments Timon, Apemantus, is a poor man’s Socrates. Socrates and Alcibiades were both great Athenians, so exceptional in virtue that their excellence soon became a source of fear, a threat to the city's cohesion. Athens created citizens so excellent, free, and philosophic, that the foundations that hold a city together – law and custom, family and duty – were threatened by their very existence. Athens killed Socrates and exiled Alcibiades. Shakespeare's Timon shows us the city they left behind. It retains all of Athens's vices (decadence, excessive individualism) but lacks what makes Athens beautiful (a love of the beautiful and the good). Timon, in his anger at the city’s failures, dies cursing it, and even gives the rebel Alcibiades funding, so that he will destroy it. Richmond’s production ends with Timon's suicide – in a blinding flash of light. But Shakespeare’s play ends a few scenes after Timon's final, desperate speech. "Here lies a wretched corpse, / Of wretched soul bereft. […] Here lie I, Timon, who alive / All living men did hate. / Pass by and curse thy fill, / but pass and stay not here thy gait." Reading this, Alcibiades announces he will march peacefully on Athens, and only punish those directly responsible for harming him and Timon. The city has a new leader; change is coming. Shakespeare's play does not end with Timon's despair or suicide. It ends with Alcibiades's victory. This Alcibiades fights for what was good in Athens, even when it seems beyond saving. Timon funded his rebellion, encouraging Alcibiades to destroy the city and slaughter the citizens. Instead, Alcibiades promises to show mercy, punish only the guilty, and usher in a new era of politics. He may fail, of course. But Shakespeare’s ending shows that Timon’s dark, narrow view of the universe is incomplete. In cutting this scene out, Robert Richmond's Timon squanders what may be the only hopeful part of an otherwise dour, dark play.